So many people suffer and continue to suffer for years with painful plantar fasciitis (heel pain). Many people believe they will wake up one morning and the pain will be gone. Unfortunately, this will not happen, you need to be proactive in ending your pain. Plantar Fasciitis is an inflammation of the arch tendon in the foot, and can be very painful. Some common reasons one will develop plantar fasciitis is recent weight gain, increased activity level, from a vacation for example, changing shoes or arthritis. There are many different treatment options for plantar fasciitis. 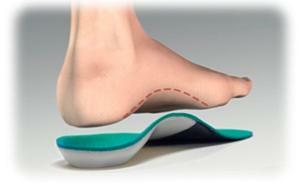 For example, cryotherapy, ultrasound, corrective surgery, and then the least invasive: orthotics. orthotics are corrective inserts used to help align your body and stop excessive motion in the foot, stabilizing the joint. At Family Foot & Ankle Specialists, we have our own Certified Pedorthist on staff who is specialized in shoes, shoes modifications, and orthotics, She will be able to help get you the perfect shoe/insert for your foot, finally ending the pain! To learn about our Certified Pedorthist click here.